All On 4 Implants Cancun Mexico - Get back your smile in All on 4 dental implants Cancun Mexico. New teeth in just 1 visit to best dental clinic in Cancun Mexico . Dr. German Arzate has over 22 years of experience in Dentistry and over a decade of placing Dental Implants, practicing Advanced Cosmetic Dentistry and cosmetic dental rehabilitation. He is a fellow of the American Dental Association (ADA), one of the first Mexicans awarded with the fellowship of the American Academy of Dental Implant Dentistry (AAID) and the American Academy of Cosmetic Dentistry (AACD). He’s the only dentist in Cancun certified by NOBEL BIOCARE and Malo Clinic to perform the All on 4 dental implant protocol and is now one of the very few dentists certified as a diplomate by the American Board of Oral Implantology/implant Dentistry (ABOI/ID). Dr. Arzate is the director of our dental center in Cancun, with full experience placing dental implants, All On 4, All On 6 and Snap in Dentures. His improved spatial perception skill allows him to work easily with the bone and to be an sculptor of smiles. Perfect Teeth In 1 visit. Our doctors can provide you with a brand new smile in just 8-10 days at our clinic. With only 4-5 appointments needed, you'll have plenty of time to enjoy the white-sand beaches during your trip with us in Cancun, Mexico! 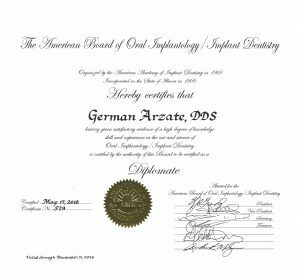 Dr. German Arzate has practiced dentistry for more than 25 years and dental implantology for more than 18. He is the director, and among his specialities are surgical and prosthetic dental implant dentistry. We are confident that your All on four dental implants will met your standards. If you should have experiencie problems, however, we will do any adjustments or implant replacements necessary for the first 5 years at no charge (restrictions apply). Providing patients with beatiful new teeth is what we do, and we do it well! We have served many happy customers from the United States and Canada. To find out what they have to say, visit our "Testimonials" tab located in the top right navigation. By the end of my treatment,I’m eating everything i want thanks to All on 4 and Doctor German Arzate. Amazing. I Can’t say anything else. After years of pain and shame, I can honestly say my joy to live was given back to me. All on 4 is a patented protocol made by Nobel Biocare in hand with Doctor Paulo Malo of Malo Clinic. It consist on placing four Nobel Biocare titanium dental implants in the jaw or maxilla; two straight and two tilted. This provides increased anchorage stability to screwed titanium bar with teeth. Dr. German Arzate is the best! All the staff is very professional, highly trained and caring. I can say that I’m leaving with more than a new smile, I have new friends! And my smile is now what I always dreamed. Visiting Cancun to get my dental treatment was the best decision I ever made. Cancun is a beautiful city, very safe and with many things to do. At the clinic everyone is friendly and profesional, i felt very safe with them and I cant be more happy with my new smile! This patient was happy to get a complete smile and can eat without worries. He was able to choose shape, size and color of his new teeth. They feel and look like real teeth. 8 days in Cancun was enough to restore his mouth and pay thousands of dollars less than in USA. James was looking for a solution to restore his mouth aesthetically. He came to our dental clinic in Cancun and decided to get All on 4 dental implants. The procedure was fast and in a few days he could smile and eat again like when he was younger! Ulmer told us that this was the very first time he came to Cancun, he decided to come to this wonderful place to get All on 4 after doing some research and noticed that the price in the U.S was too expensive for the same procedure. He can now eat and smile confidently. Reviews – Another great case of All on 4! The All on 4 procedure was a great decision for my teeth. The very thought of going to the dentist scares me. My gums and teeth were in a terrible shape. Dr. Arzate fix all of that, he did an excellent job and I’m forever grateful. When it comes to dental implant vacations in Cancun, there are several activities that you cannot miss, depending on the season. Replacing lost natural teeth with dental implants to overcome the problem of loosing teeth has been an option for a very long time. But why people loose their teeth? Who came up with the idea of replace the lost ones with dental implants? When coming for a dental vacation in Cancun to have All on 4 dental implants procedure, many patients ask us if their cleaning routine will be much different or difficult with their new screw retained teeth. There is evidence that humans have attempted to replace missing teeth with different types of dental implants for thousands of years back in the past.